For American online poker players in particular, being able to easily make deposits and withdrawals is pretty key to the experience. So much that’s happened to the industry in this country has disrupted the ability to make these transactions, and that’s why we’re going to break down all of the Americas Card room deposit options for you here. Some of these will be available internationally, but we’ll also point out the best Americas Cardroom withdrawal methods for US players. In what follows, we’re going to show all of the available banking methods that Americas Cardroom has to offer and which to use if you’re an international player or a US player. Just remember that no two cases are the same, so what works best for you will depend on your own particular situation. In what’s probably the easiest of the Americas card room deposit options, you can use a Visa debit card or credit card. There’s also an Entropay-powered, pre-paid Visa option that you can use if you want an extra buffer between the site and your actual card. Certain Visa cards will work from the United States, though it’s not always clear which will work and which will not until you try. Pre-paid Visa debit cards have also seen a high rate of success, if they are approved for international payments. Players can make deposits and withdrawals with bitcoin and 60+ other cryptocurrencies. This site will not hold your account balance in bitcoin or those cryptocurrencies, however. Instead, it’s instantly converted to US dollars when you deposit based on the current exchange rate, and it’s converted back to bitcoin when you cash out. Players can purchase BTC with a debit card on an online exchange like Coinbase, GDAX, Bitfinex, Bitstamp etc. or with Paypal on Virwox or LocalBitcoins. EcoPayz, Skrill and Neteller are available to different people in different parts of the world for transactions at Americas Cardroom. At the moment Paypal isn’t accepted yet for direct deposits. These are very reputable businesses, and they’re safe options. The only issue with these is that they aren’t available for US players for gambling transactions. Different money transfer services can be used to make a person-to-person transfer, and this is a popular option for US and international players alike. The key to this option is that you’ll need to contact support for details since they have to give you a confirmation number and a place to send the funds. This is only slightly more time-consuming than getting a pre-paid Visa card, and it’s the only option for an Americas Cardroom withdrawal for some US players. 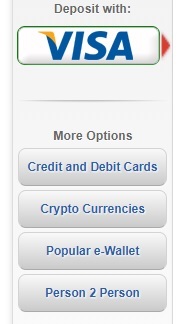 Unfortunately on Americas Cardroom Paypal is not a deposit option yet. However players can buy Bitcoin with Paypal on an online exchange such as Virwox or Localbitcoins, and then use those BTC to deposit onto Americas Cardroom. If you’re a RoW (rest of world) player or an American living outside of the US you’ll find more deposit methods are available at Black Chip Poker, which shares the same network, playerpool and software as ACR. Existing ACR players can open a second account at BCP to activate another $1000 deposit bonus – just like iPoker players can ‘bonus whore’ by creating accounts on several skins across the Winning Poker Network. For example, Black Chip Poker accepts Skrill (formerly Moneybookers) deposits, as well as debit cards and Bitcoin (or BTC purchased with Paypal). Open an account with Rakeback.com for 27% rakeback on demand.